The Renogy Wanderer is a 30A PWM solar power charge controller. This advanced negative-ground controller is designed for off-grid solar applications and can be used with a 12V battery or battery bank. Integrating highly efficient PWM charging, the Wanderer increases battery life and improves system performance. It has 4 Stage PWM charging, such as Bulk, Boost, Float, and Equalization that will prevent the batteries from overcharging and over-discharging. The controller comes equipped with fully comprehensive self-diagnostics and electronic protection functions to prevent damage from installation mistakes or system faults. The LED indicators will inform you about the status and the remote temperature sensor will measure the battery’s temperature. Moreover, the remote is using this data for accurate temperature compensation. Remember that Renogy Wanderer — 30A PWM is compatible with Gel, Sealed and Flooded batteries. LED Indicators that inform you about the charge controller’s status. You need to use the special remote temperature sensor, which is needed for an accurate temperature compensation, if the battery is installed far in the charge regulator. The sensor enables the device to correct target voltages during the charging process. As practice shows, the detector use causes a great system performance and a life of this battery. 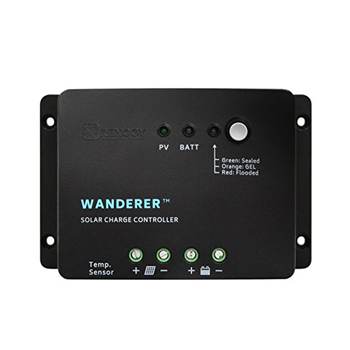 The Renogy Wanderer comes with protective features against overcharging, short circuit and reverse polarity connection from damaging the solar charge regulator to prevent setup mistakes and different problems.